Last year in the UK, a Panorama investigation uncovered systematic abuse of elderly care home residents who were ­being routinely pushed about, belittled and ­humiliated by their so-called carers. Worse, when whistleblowers drew attention to the abuse it was they themselves who were disciplined by senior management. It took Panorama for this to come to light and for action to be taken. It was the latest in a long line of depressing stories of toxic leadership. From MPs to journalists, bankers to CEOs of big pharma and oil, the modern era seems one where the very idea of leadership is being eroded and betrayed by the people we appoint, elect and follow. Theorists like Bruce Avolio and Michael Brown have argued that we need a more authentic and ethical form of leadership, which connects leaders to what really matters to them. Given the crisis of leadership at least in the Western world, connecting leaders more powerfully with their values is surely long overdue. Perhaps unsurprisingly, this kind of ‘values-led’ or ‘authentic’ leadership also generates trust, hope and optimism in followers, which in turn is said to filter through into attitudes and behaviours. There is really only one problem with these ‘authentic’ forms of leadership: they are bloody difficult to execute. They get derailed by circumstance and expedience as well as by existing (often toxic) organisational cultures. It takes a special kind of willingness and courage to execute values in practice. Most modern leadership theories deal with leadership as though in a vacuum; as though all that remains after identifying our values is to get out there and do them. Yet anyone who knows anything about ACT knows that understanding our values is really only half the battle. 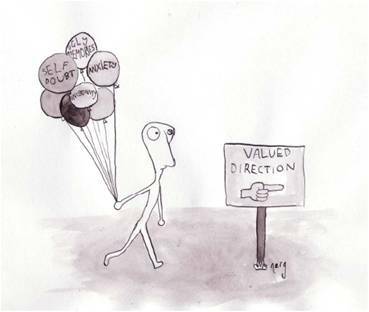 Values have a flipside – an admission price which unless paid will bar the way forward. What then can we teach our leaders to help them live their values and pursue a more authentic style of leadership? Psychological flexibility is the key, and it is for this reason we should be teaching it in our business schools. Psychological flexibility is psychology for the real world, or as Todd Kashdan puts it, the ‘messiness of human life’. It helps people clarifying and understand their values with a workable, behaviour-based definition which helps people understand what their values mean in practice and context. It helps leaders move towards what they value. Psychological flexibility is a practical skill which helps people understand the cost of moving towards values (or the ‘flipside’ of valued-living). By building willingness to have difficult thoughts and emotions, it reduces the natural human tendency to avoid them – experiential avoidance. This is liberating and powerful because we become less beholden to short term thoughts and emotions which have the tendency to get us stuck or drag us away from our values. We get to choose our behaviour more consciously. It helps people stay more aware of the present moment, which means that they are likely to be more open to others, empathetic, and engaged with other people. It also tends to improve task focus, reducing distraction, which in turn improves task performance. These are key factors in improving leadership, engagement, performance and productivity. It is also a significant factor in wellbeing. Too many leadership training programmes focus on values and forget to train people in the skills that help them live their values. For this reason it seems inevitable that the impact of ACT in the clinical area is soon to be felt far more widely in the occupational. Next Post If You Can’t Have It All, What Can You Have?